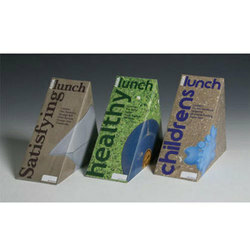 We are a leading Manufacturer of paper food boxes, fast food box and food paper boxes from Thane, India. 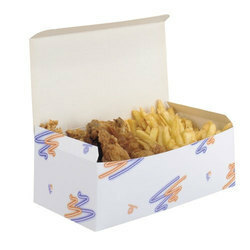 Sandwich boxes, snack boxes, take away boxes, etc are made from food grade boards. An additional film can be applied on the inside to protect it from the oily food. We make stylish and high on utility boxes for Fast Food Box which are very popular among the current generation of college goers and office goers who have no time to spare. 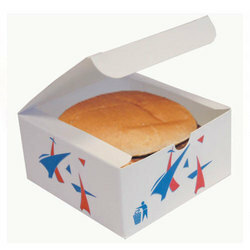 These are specially designed to carry it in spill proof, no mess and hygienic way while traveling or in rush. It is specially demanding by new multinational food chain stores and fast food joints to supply Frankies to customers in a hygienic and attractive manner. It is available in all sizes and gsm as required. These boxes are made of Food grade boards. These are one piece or two piece boxes. Kindly contact for bulk inquiries.